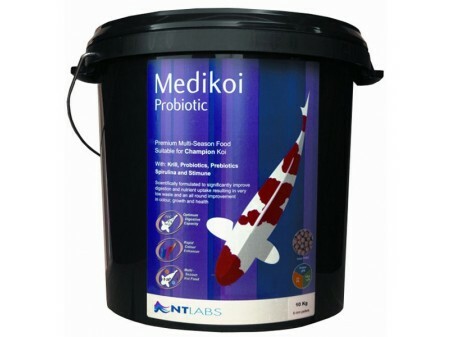 Medikoi Probiotic has been specially formulated after years of research and development to bring you a professional diet for Champion Koi. The highest quality ingredients found in Medikoi Probiotic promote healthy growth development the desired body shape and significantly enhance colour definition in Koi whilst massively reducing waste.Medikoi Probiotic food provides beneficial probiotic bacteria for Koi but it also contains a food for the beneficial bacteria too in the form ofa prebiotic (fructooligosaccharide). This combination ensures a vigorous population of gut bacteria and digestive enzymes (ODC) which over time results in a vastly improved ability to absorb nutrients and optimise waste.